Malkin began her career in newspaper journalism with the Los Angeles Daily News, where she worked as an editorial writer and weekly columnist from 1992-94. In 1995, she was named Warren Brookes Fellow at the Competitive Enterprise Institute in Washington, D.C. In 1996, she joined the editorial board of the Seattle Times, where she penned editorials and weekly columns for three and a half years. Today, her syndicated column appears in over 100 papers nationwide. 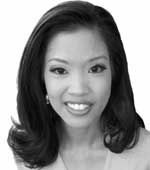 Malkin, the daughter of Filipino immigrants, was born in Philadelphia and raised in southern New Jersey. She worked as a press inserter, tax preparation aide and network news librarian; she is also a lapsed classical pianist. Malkin's hobbies include crocheting and pier fishing with her dad. A graduate of Oberlin College in Oberlin, Ohio, Malkin currently lives with her husband and daughter in Maryland. "Are you sure?" I asked my daughter before writing this column. Here in my adopted home state of Colorado, orange is the new Animas River, thanks to the blithering idiots working at President Barack Obama's Environmental Protection Agency. Get off that late-summer snooze button, America. The Obama administration is plotting to break a major promise made under oath — and jeopardize our nation in the name of social justice. The gruesome hits keep coming for the baby butchers of Planned Parenthood. President Obama and his top health officials have one last-ditch response left: Quick, hide behind the imaginary mammogram machine! It's the most far-reaching scandal in Washington that no one wants to talk about: Tens of millions of federal employees had their personal information hacked as a result of Obama administration incompetence and political favoritism. Another week, another money-grubbing Planned Parenthood baby-parts harvester exposed. Hannibal Lecter ain't got nothing on the profit-maximizing abortion ghoul caught on tape hawking aborted baby parts as she swilled wine and nibbled on a gourmet salad. Is your church abetting a sanctuary nation? The random, heartless murder of a young tourist on San Francisco's Pier 14 by a five-time deportee who benefited from the "progressive" city's sanctuary policy has law-abiding Americans, law enforcement officials and political opportunists of all stripes up in arms. America is still reeling from the horrific Charleston, S.C., massacre at Emanuel African Methodist Episcopal Church that claimed the lives of nine innocent people. Why was America so shocked by homegirl hoaxer Rachel Dolezal? It was 15 years ago this week that my beautiful daughter Veronica entered the world. She didn't make a sound. As I stretched out my arms to hold her in the delivery room, furrow-browed doctors and nurses instead whisked her away. It's increasingly difficult to tell the difference between Teach for America — whose leaders are at the forefront of inflammatory anti-police protests in Baltimore; Ferguson, Mo. ; and now McKinney, Texas — and left-wing activist groups such as Organizing for Action (President Obama's partisan community organizing army).